This is every exciting my first book review! when Kayleigh recommended this book to me i have to say i wasn't sure it was going to be my cup of tea. i remember sitting in developmental psychology just enjoying looking at the front cover more than anything! i have just finished reading it for the second time (no where near enough times if you as me) and i had to have it as my first review! katy and her mam move to a small town which promises time to read, blog and become totally bored while her mam is away working! This all changes the moment she makes the decision to call on her next door neighborgh. she is greeted at the door by the most amazingly stunning but incredibly arrogant guy daemon. her life takes another unexpected walk on the bright side after meet his twin sister Dee. she finds her self sucked to to the unexpected when she discovers her new best friend and frenemy are aliens.Katy's life takes an unexpected twist when she finds herself in a race to protect her new friends! Far from the pages of her novels can katy rise up and save her friends? i have to say i loved this book it is number one on my list! i read it in like 2 days i could not put it down.. seriously once you start you just can't stop! 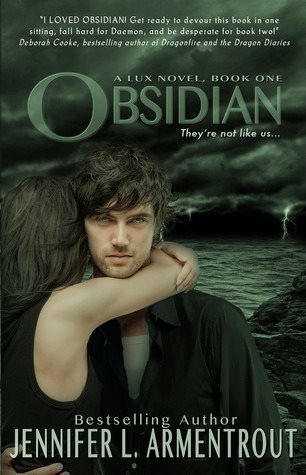 i got caught up the story of daemon and katy and just had to know what was going to happen next! i loved the story line! there was action, romance and a arrogant but totally swoon worthy boy what more could you as for. what can i say about daemon seriously! i love the face that although he is totally stunning katy fights him off. if i had seen those green eyes starring at me i doubt i would have been so good at it on the other had i loved how real the reaction was when he was a jerk to her the first time he opened the door if you as any of my friends that is totally my reaction. i just loved this book from start to finish every single page dragged me in! the story is incredible, the characters are amazing and you will laugh out loud at katy and daemons relationship! it will seriously have you begging for more i cant wait to see what is going to happen to katy and daemon! Welcome to the world of blogging! I'm a fan of Kayleighs & she was kind enough to FB about your new site. Looking forward to reading more reviews! thank you! i am so excited about starting to write some reviews!